Beauty Resource trials two popular hot cloth cleansers, a classic and a newbie – but which will emerge triumphant? There have been many different skincare trends over the years, but one that has stood the test of time is the hot cloth cleanser. Using creamy formulas to remove facial and eye make up, the beauty of these cleansers is the hot cloth removal. Working to polish and gently exfoliate the skin, complexions are left looking clean, soft and rejuvenated. While there are now many interpretations on the market – one of the first brands to develop this type of cleanser was Liz Earle. Here at Beauty Resource we wanted to put this award-winning classic up against a relatively new formula – REN’s Centifolia Hot Cloth Cleanser, to see which cleanser worked best. toner revealed some dirt/make-up left on skin. Having tried out some other REN products, we were keen to see how their version stood up. A two-phase cleanser that claims to purify and exfoliate skin, this formula promises not to leave skin feeling dry. felt as if it may irritate sensitive skin. Overall, there were different pros and cons for both. 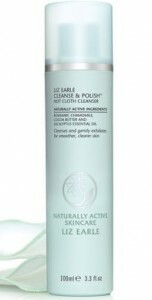 Ideally we would like a hot cloth cleanser that has the cleaning abilities of REN’s product with the gentleness of Liz Earle’s cleanser used with the wonderful stay-hot cloths. So, while both products do the job and make skin feel great – the hunt for the *perfect* hot cloth cleanser continues. If you fancy treating yourself to a professional facial, please visit our facials page.